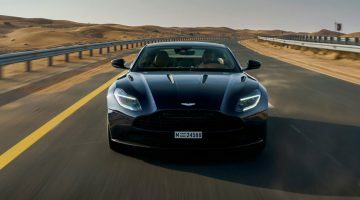 Still, the initial signs are promising as today’s Aston Martin Vantage features dramatic looking styling inside and out, plus it’s the latest model to benefit from the input of minority stakeholder Mercedes, meaning it gets the muscular 503bhp twin-turbo V8 normally found under the bonnet of any number of AMG machines. Early cars failed to light our fire, but we’re pleased to report that Aston Martin seems to have fixed early quality niggles and production-spec cars are now up to the dynamic and quality standards you’d expect for a $157k luxury sports car. 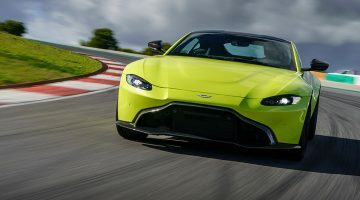 While it doesn’t yet match the all-round ability of something like a Porsche 911, the new Vantage has bags of character and serves up an entertaining cocktail of performance and presence that fits perfectly in the Aston Martin range. With a starting price of $158,300, the Aston Martin Vantage is far more expensive than its predecessor. In terms of performance, technology and desirability the higher price is arguably justified, but it also puts the Aston on a collision course with some supremely talented rivals. Take the Audi R8, for instance. For starters it looks stunning, while in $167,900, 562bhp V10 quattro guise it’s got the Vantage covered for driving dynamics and just beaten for sound and fury – that howling V10 is one of the great internal combustion engines. With its mid-engined layout, all-wheel drive and that Audi badge it’s a very different proposition to the Vantage, but well worthy of your attention. As is the Porsche 911. Porsche hasn’t yet furnished us with details of the 911 Turbo version of the latest 992, but the last car put up a strong fight to an admittedly dynamically-hobbled Vantage. The regular 992 is already a polished product, but does lack one aspect the Vantage has in spades: character. It’ll be fascinating to get the pair together. Even Britain itself can field a Vantage rival, though like the R8 it’s cut from a very different cloth. Next to Sennas and Speedtails the McLaren 570GT doesn’t generate many headlines, but its huge performance and flowing ride quality mean it’s as much a cruiser as a B-road thriller. Like the Aston the cabin is imperfect and despite its GT badge luggage space is still limited for touring, but at $201,000 it’s another worth considering. Besides, even in off-the-shelf form the V8’s vital statistics of 503bhp and 505lb ft are hardly to be sniffed at. The latter figure is developed at just 2000rpm, hinting at some real muscle for the rear wheels to cope with, but more on that later. 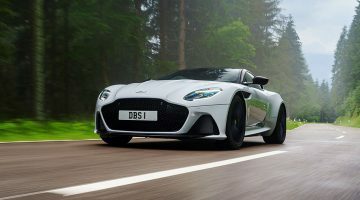 Mated to the Mercedes engine is the now familiar ZF eight-speed automatic transmission, which Aston favours over Mercedes’ more complicated seven-speed unit. As you’d expect, the Vantage is a lively performer, with the 0-100kph dash delivered in a claimed 3.7 seconds (over a second faster than the old car), while top speed is a heady 314kph. That said, in reality the Aston can’t quite match the former figure, a lack of traction meaning we could only record a time of 4.5 seconds. However, once rolling the Aston gathers speed with real intent, the tidal wave of torque catapulting the car up the road. It may not be as rabidly quick as Porsche 911 Turbo, but it’s not far behind. The tweaks to the ECU have also delivered a more linear delivery, so despite the breaks in traction it doesn’t feel as if the unit is dumping all its torque on the road in the same way as in an AMG does. Those imperfections? Well, for starters it feels big. At 2153mm it’s around 200mm wider than a Porsche 911 Turbo, a fact that is exacerbated by the Vantage’s low-slung driving position, high-set dashboard and slimline windscreen, all of which combine to create a feeling of claustrophobia. The first few kilometres brings the intermittent ‘thud-thud’ of cats eyes as you acclimatize to the Aston’s size. It’s unlikely that those dropping the best part of $157k on a car are going to be having sleepless nights over the cost of a re-fill, but for the completists here are the numbers. So, Aston states 230g/km CO2 emissions and a 10.5L/100km return at the pumps. You’ll have to treat the latter with a pinch of salt, as low 20s is more realistic with gentle use and single fingers possible when you get greedy with the throttle. On the plus side, Aston is offering the Vantage with a complimentary five-year servicing package, which should take the sting out of maintenance bills and help the residual values. Inside, the Vantage takes a radical departure from its predecessor. Gone are the analogue dials and creaky, outdated infotainment system, to be replaced with bold design and cutting edge kit. There’s a configurable TFT screen ahead of the driver, while the infotainment system is pure Mercedes (as is the single stalk controller for the indicators, wipers and main beam). The rest of the switchgear is scattered across the wide transmission tunnel, including the starter button, which is a similar shape and size to the fan speed controller above it, resulting in the odd fumbling moment as you try to start to the car but succeed in only adjusting the air-con. As with the handling, early concerns over quality have largely been solved – there are still a few creaks from the leather trim but ill-fitting panels and the wind noise we noticed in early cars has now disappeared. Practicality is good, too. The trademark hatchback means easy access to a boot that has the McLaren 540C and Audi R8 beaten for carrying capacity. The cabin is roomy as well, although it’s spoiled by poor visibility. Less impressive is the front, which looks a little bland despite a gapingly large version of the trademark Aston grille. We’re yet to be convinced by the front end styling then, but it’s fair to say that it’s better in some colours than in others, so spend some time on the Vantage configurator before heading to the dealer and you’ll come away with something quite attractive.